Hello! 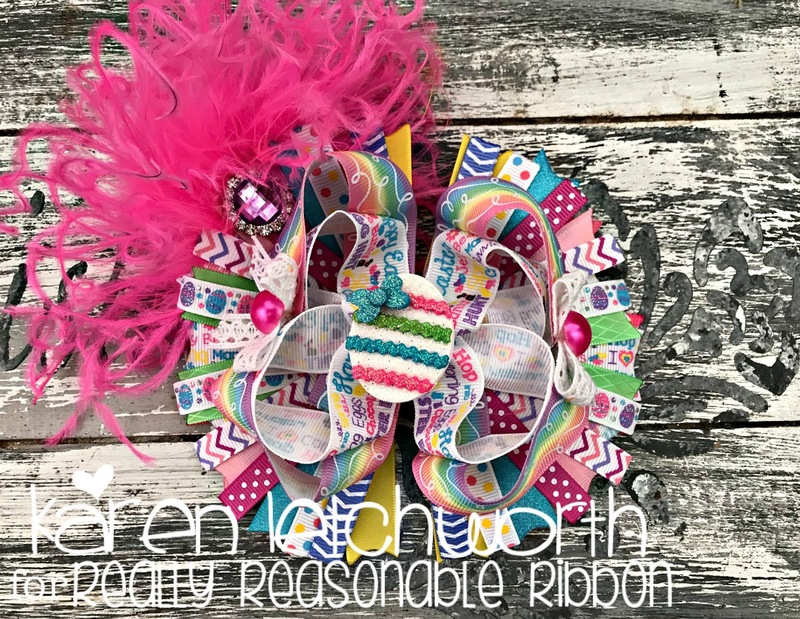 Welcome by today for the March Blog Hop with Really Reasonable Ribbon as we share projects made with this month's GORGEOUS Ribbon Club Assortment. You should have arrived here by way of Bonnie's Blog; but if you didn't, it's easy to get started and catch up. Take a look at this month's sweet assortment of ribbons. Each and every trim found in this month's lovely Ribbon Club Assortment is used, and you can see how they all tucked nicely into this one amazing girls' hair bow. It is secured on the back side using a French Clip. The French Clip comes in several different sizes, and there are also lots of other great Hair Accessories carried at Really Reasonable Ribbon. 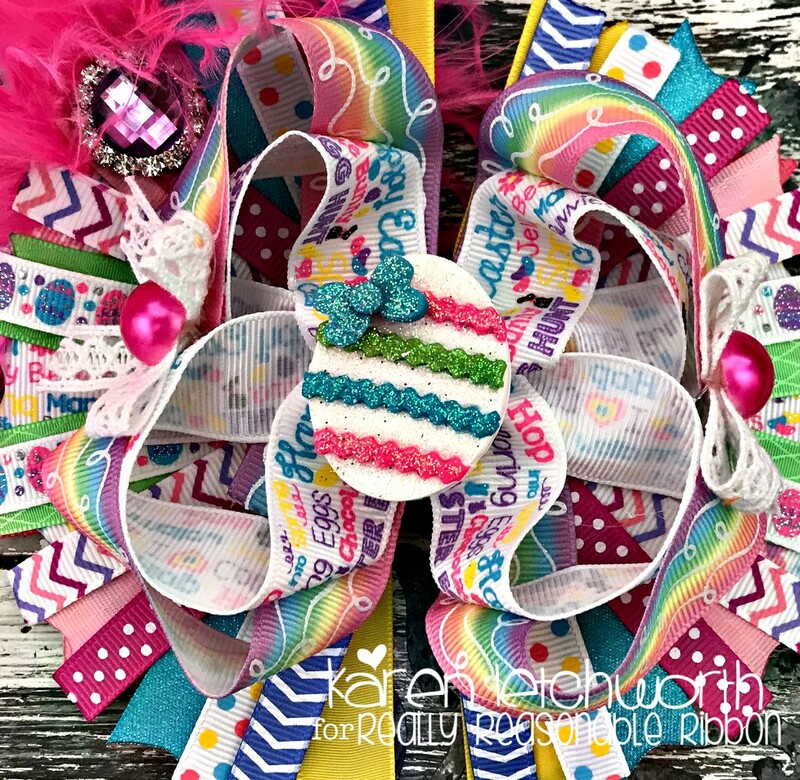 You may notice some Pearl Embellishments, a Rick Rack covered egg, a sweet Rhinestone Embellishment, and a big beautiful, fluffy hot pink feather....just to make the bow extra fabulous! 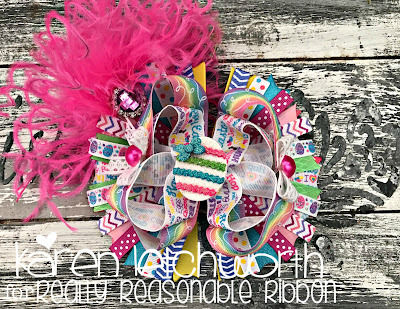 You will see a length of the 3/8" Select Swiss Dots Grosgrain Garden Rose Ribbon, 5/8' Sherbet Delicate Stitched Satin Ribbon, 3/8" Tutti Frutti Chevron Striped Grosgrain Ribbon, 5/8" Daffodil Taffeta, Rachel White Cotton Crochet Lace (smaller bows on the sides of larger bow), 5/8" Green Flash Diamond Satin, 3/8" Fun Dots on White Grosgrain, 5/8" Turquoise Shimmer Satin, and 3/8" Wisteria Chevron Grosgrain. Like I continue to say over and over again (because it's SO true) is that quite honestly....ALL of Really Reasonable Ribbon's trims work together SO nicely. It's just SO easy to put together different combinations of their lovely ribbons and trims, seam binding and twine, embellishments, and SO much more. They really have it ALL at Really Reasonable Ribbon. OK friends......your next step is at my sweet friend, Kathy's Blog. She comes up with something AMAZING every month, so you won't want to miss that. 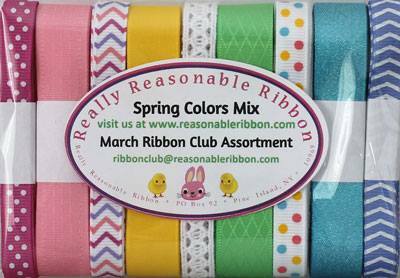 Also, you will need to answer the "Question of The Month" at the end of the Blog Hop on the Really Reasonable Ribbon Blog in order to be eligible for the monthly Blog Hop Prize.....this month's GORGEOUS Ribbon Club Assortment (shown above). How ADORABLE are all those trims? Beautiful hair bow Karen. Perfect for Easter!! in this month's assortment. I love Spring colors! Sweet hair bow--love the ric rac egg. This is an awesome, bright hair ribbon! What an awesome hair bow for a little girl...so fun and colorful! Really cute bow! Love the colors. Your little girls hairbow is so adorable! I can just imagine some little lady bouncing around looking for Easter eggs wearing this in her curls.